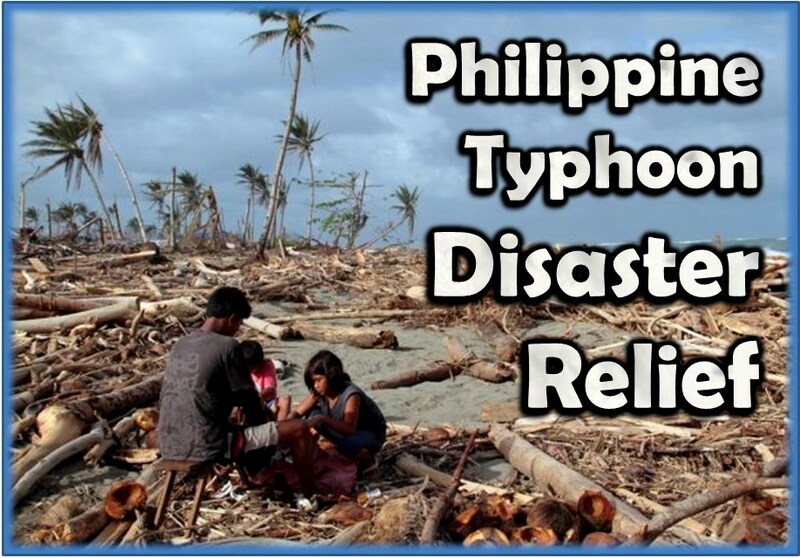 After the typhoon that ravaged the Philippines earlier this month and the tornadoes that ripped through Illinois and Indiana earlier this week, United Methodists are in full relief and recovery mode. Bishop Lowry has called for prayers for the victims and response teams to these affected areas and a special offering to be received for the Philippine relief effort. Of course, we also have United Methodist Volunteers in Mission (UMVIM) teams hard at work right here in our own conference assisting (and in many cases leading) the relief efforts in West and Granbury. Here’s the latest from the efforts here in the CTC and abroad. 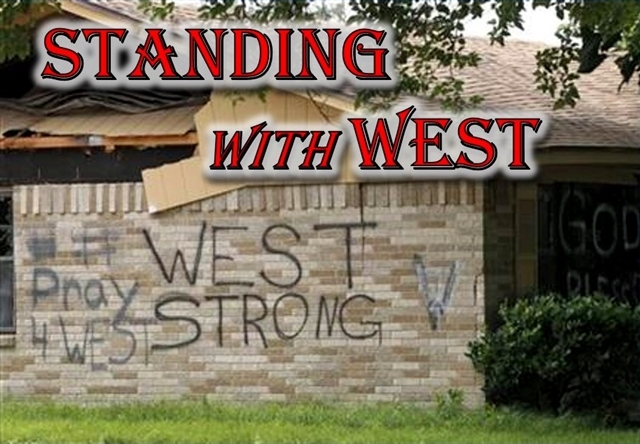 Contrary to some rumor, whispers and reports around the area, the last few months has seen progress being made in West. The four Central Texas Conference case managers have been doing a fantastic job of meeting with clients and building Disaster Recovery plans with the people of West. However, even when partnering with the volunteer case managers from White’s Chapel UMC and First Mansfield UMC, the case load was too big and the need so immediate for that group to effectively manage. Thankfully, an even larger than anticipated grant from UMCOR has been received, which allowed for four additional case managers to be hired and trained and two more volunteers to be added to help speed up the process for the families. Nikki Leaverton, the CTC Case Management Supervisor, Julie Ivie, Jinger Myers, Melissa Fuston, Carrie Laxson, Brenda Jones, Pete Arias and Mark Edwards are the Central Texas case manager team in West and they are doing a great job representing the United Methodist Church and the Central Texas Conference as they help the clients make their plans to repair and rebuild their homes. The conference has also hired Stan Gregory as the assistant disaster response coordinator to help Laraine Waughtal, CTC Disaster Response Coordinator, coordinate efforts and teams in West. Stan comes with a background in working the Hurricane Katrina and Rita disaster responses and has owned a restoration company. He also serves on the Conference Disaster Response Task Force. Stan will be assisting the case managers by checking out damages, assessing needs, checking bids and setting up projects that will be handled by volunteers. The full time Construction Manager is being hired by the Long Term Recovery committee for the City of West and will not be on board until January. As such, the major rebuilds will not begin until 2014. The great news is that all of this is getting everything set up for this process. This process is long and tedious as homeowners go through FEMA paperwork and appeals, the SBA loan process and finally the Unmet Needs table if they are underinsured or not insured at all. The process moves at a different rate for each community and disaster. The First United Methodist Church of West continues to be a great asset to and leader for the community as they work with our case managers and help with special needs for local families. The members of the CTC can be proud of the work our conference is doing in the community of West and we will need so much more help in the year ahead as the big rebuild process truly gets under way. 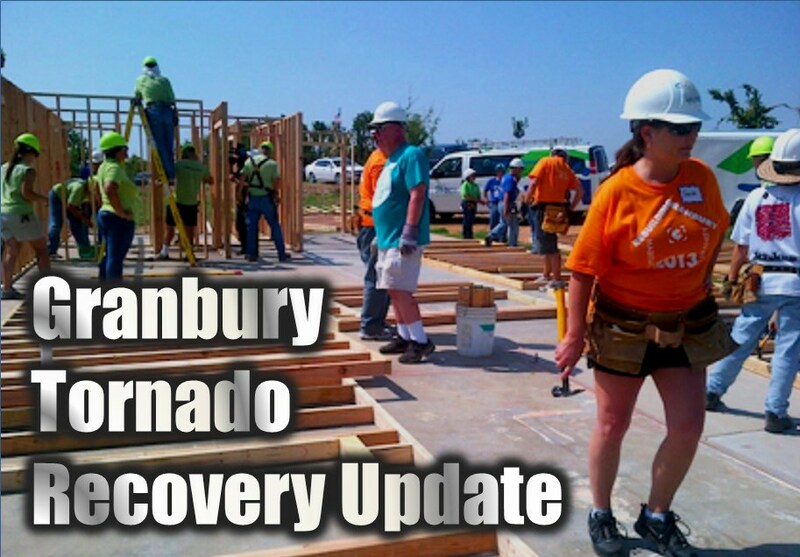 An F4 tornado may have moved through Granbury, Cleburne and the surrounding area; however, it cannot measure up to the power of the response of God and God’s people of The United Methodist Church and many other churches, businesses and organizations. The Central Texas Conference had more than 270 volunteers who put in well more than 10,000 hours in the relief and recovery phases of the Granbury recovery effort. 35 CTC churches answered the call in the clean-up and rebuilding effort. Larry Mullins, a long-term volunteer through the General Board of Global Ministries has been leading our construction projects since September. Teams have recently done everything from sheet-rocking to tiling, installing kitchen cabinets and countertops, siding, painting, building decks and more. The relief teams will soon be receiving six modular homes that were generously donated from Fort Hood to families who lost their mobile homes and will be doing remodeling on the interiors to make the most of the space. The CTC UMVIM team would like to say a huge thank you to the churches of Central Texas Conference and those teams from the North Texas Conference and Northwest Texas Conferences who have made it possible for so many families to return to their homes. However, the work is not done and help is still needed. If you or your church wishes to volunteer, visit the ctcumc.org Volunteers in Mission page. Typhoon Haiyan, possibly the strongest storm ever to make landfall, battered parts of the Philippines on Friday, Nov. 8. With sustained winds of 195 mph, the category 5 storm cut a swath of devastation across the tip of Cebu and tore through the three large island provinces of Samar, Leyte and Bohol. UMCOR, the relief agency of The United Methodist Church, is working with partners in the Philippines to provide assistance following the typhoon. Bishop Lowry is asking the people of the CTC to be in prayer for all those affected by and responding to the disaster. He also called on the churches of the Central Texas Conference to receive a special offering for our brothers and sisters in Christ in the Philippines suffering from the onslaught of Typhoon Haiyan. Central Texas Conference Churches, small groups and/or individual who wish to contribute to the funds for relief and recovery are asked to submit those donations to the Central Texas Conference Service Center. You may do so online via the Online Payment tool (look for fund number 4641 under the Advance Specials & Other Givings section) or by mailing a check payable to CTC along with the CTC Remittance Form (click here to access a blank form) with “#4641” written on one of the forms available blank lines. Checks should be sent to Central Texas Conference, Attn. David Stinson, 464 Bailey Ave., Fort Worth, Texas, 76107. United Methodists are working throughout Illinois and Indiana to determine the extent of damage from the multiple tornados that swept through the two states Nov. 17. While there were reports of damage in other states, the storm’s path took its greatest toll in Illinois. 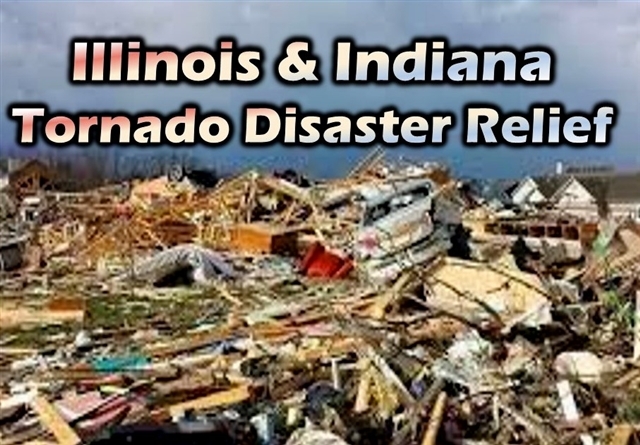 The Illinois Great Rivers Annual (regional) Conference is posting updates on the conference’s Facebook page and a special page on its website — Illinois Tornados 2013. The conference has confirmed extensive damage in Washington and damages to home in neighboring towns. Six casualties are confirmed, but search and rescue was ongoing at publication time. The Northern Illinois Annual (regional) Conference also is using its Facebook page and its website to provide information on the recovery and relief efforts. 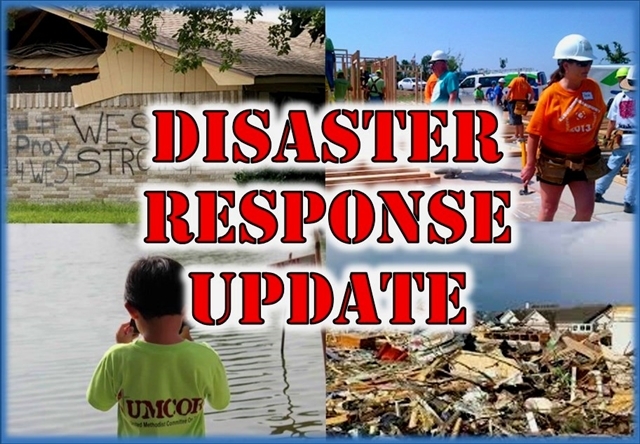 Relief efforts in the communities affected by the Nov. 17, 2013 tornados will be funded from the United Methodist Committee on Relief’s US Disaster Response advance (#901670). One hundred percent of gifts designated for USDR Tornadoes 2013 will support the response in Illinois and other areas where the tornados hit. *Laraine is the CTC Disaster Response Coordinator and the pastor at Morgan Mill & Bluff Dale UMCs.